Alabaster. Manufactured in Egypt ca. 9th or 8th cent. BCE; imported to Rome and reinscribed late 1st century BCE or early 1st century CE. CIL VI 1282 = ILS 882. Paris, Louvre MuseumInv. Nos. N 386 / D 34 / MR 889. 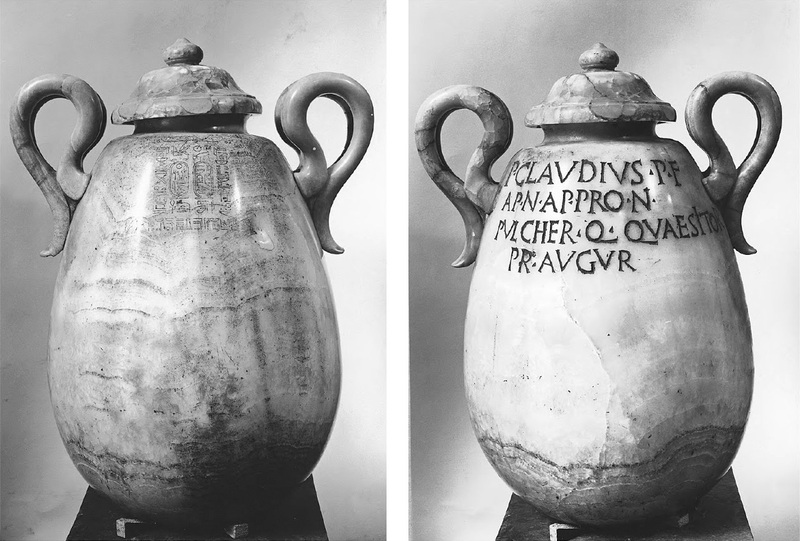 Vessel with inscription of Nebneteru and epitaph of P. Claudius Pulcher. Inv. Nos. N 386 / D 34 / MR 889. Found in 1615 at Rome, near the Theatre of Marcellus. Arrived in the Louvre in 1808 from the Borghese collection. Karl Jansen-Winkeln. Inschriften der Spätzeit. Teil II: Die 22.-24. Dynastie. Harrassowitz Verlag, 2007. S. 302. To see these various dynamics in play, let us look in some depth at a single case of an imported object, a vessel that first served as a votive offering in Egypt and then as a cinerary urn in Italy, considering how the Egyptian origin and function of the object informed its reuse in Rome. The vase stands just over two feet tall (66 cm) and is hewn from a single piece of calcite alabaster. [Figure 1.2 a, b] It has a particularly rich biography. Inscriptions on both faces, one a hieroglyphic inscription dating to the ninth century BCE and the other a Latin inscription dating to the early first century CE, illuminate both its Egyptian and Roman lives. Much is known, too, of its post-antique history. The vase came to light “near the Theatre of Marcellus” in 1615. The Borghese family purchased it for a growing collection, and it was in the family’s hands for centuries. In 1808, it was acquired for the Musée Napoleon. Today, it remains in the Louvre’s department of Egyptian antiquities.30 Even a brief history of the piece shows that it has played many parts in its time: offering, memorial, and objet d’art. Even more remarkable is that it can be connected with the ownership of identifiable individuals at a number of phases in its life, from creation to curation. The hieroglyphic inscription on the front face states that the vase was a dedication made by a priest of Thebes named Nebneteru, given in honor of the king’s health and good fortune. The formulae describing the king suggest it was made either under Osorkon II (c. 874—850 BCE) or Osorkon III (c. 777—749 BCE).31 Nebneteru belonged to a family that could trace its genealogy through five generations — a prominent priestly family in Thebes in a charged time for relationships between the kings of Egypt and local elites.32 During the reign of Osorkon II, for example, a priest named Hariese declared himself to be the ruler of the region, attempting to eclipse the king’s authority, even constructing a royal tomb for himself at Medinet Habu.33 Comparison with slightly later material suggests that such vases were prestige objects used in elite rituals of gift-giving, perhaps containing expensive unguents. One of p.26 this size, moreover, would require a sizeable block of stone, likely imported from Egypt’s eastern desert. 34 As an Egyptian object, then, this vase reflects a single individual’s affirmation of the office of the king but also represents a show of that individual’s own wealth and connections. P. Claudius Pulcher belonged to one of the most illustrious families of the late Republic. His father was Publius Clodius, Cicero’s famed rival (tribune of the plebs, 58 BCE); his grandfather was Appius Claudius Pulcher (consul 54, p.27 censor 51 BCE); his great-grandfather was Appius Claudius Pulcher (consul, 79 BCE).37 Literary evidence allows us to flesh out his biography. After his father’s death, P. Claudius Pulcher’s mother married the triumvir Mark Antony, who betrothed his sister to Octavian to solidify their alliance, though the union was eventually annulled.38 Cicero knew of him, too, and thought him a promising young man. For Valerius Maximus, his life was an exem-plum of misspent youth; he makes reference to P. Claudius Pulcher’s affair with a prostitute, leading to a shameful and horrible death by disease.39 (The brief cursus honorum on his monument suggests a distinguished early career cut short, although not for what reason.) Two children survived him, including a son who rose to the consulship in 21 or 22 CE.40 The case is all the more interesting, then, because P. Claudius Pulcher lived at a pivotal time in Rome’s dealings with Egypt, though he was too young to have been part of the conflict between Octavian and Antony and Cleopatra. How important was the object’s Egyptian-ness to its later use? P. Claudius Pulcher’s memorial would have made an impressive visual impact, for it is a large piece of especially fine striated stone. According to Pliny, the best alabaster was the color of golden honey and had pronounced whorls, and that from Egypt was considered good; Romans appreciated alabasters for their abilities to preserve their contents and for their appearance.41 Other similar examples give us some purchase on the social value of an object of this type. There are a few other extant Roman funerary urns of Egyptian calcite alabaster, including another reworked from an Egyptian import. Germanicus’s young daughter Livilla was said to be buried in an alabaster urn, as was the emperor Septimius Severus.42 Although it might be tempting to read something into the overt appropriation of an Egyptian urn by Antony’s son-by-marriage, this context suggests that the urn did not make a simple statement about its owners political affiliations, which might otherwise seem a natural assumption. The modifications were expedient, creating a new functional object from recycled material. Placed within a niche in a tomb, the hieroglyphic inscription and the Egyptian fabrication of the object would have been invisible. At the same time, the urn made ostentatious use of a costly and luxurious material known to be from Egypt, later deemed worthy of the imperial family and certainly notable in early Augustan Rome. The Egyptian origin of the material was paramount, the place of its production, secondary. This example, then, showcases a work of both Egyptian and Roman manufacture. The same is true of many other imported artworks in Italy. 30Louvre N 386 — D 34 — MR 889. The vase is little known. My information about provenience comes from the Louvre’s files, courtesy of Mme. Catherine Briddoneau. For basic discussion, see also Musées de France 1970, no. 124; Martinez 2004, no. 1057, no. 1167, and antiquarian sources cited. 31“The son of Re, beloved of Amun, son of Isis, Osorkon, the image of Amun, beloved of Amun-Re, master of the thrones of the two lands, master of the sky, lord of Karnak.” My rendering is after the translation (in French) of Musées de France 1970, no. 124. For full transcription of the hieroglyphic text, Gauthier 1914, 3. 386; Pierret 1978, 2. 86. Kitchen 1986 (211) dates the vase to Osorkon III. 33Myśliwiec 2000, 47—51; Kitchen 1986, 197—98. 36CIL 6. 1282 = ILS 882: P. Claudius P. f. | Ap. n. Ap. pron. | Pulcher q. quaesitor | pr. augur. 37On the sources for his life and career, PIR2 C987. For the standing of the Claudii in the early imperial period, see Wiseman 1970b, especially 210—213. He suggests that P. Claudius Pulcher changed his name back from the innovative spelling (Clodius) for political expediency. 39Cic. Fam. 14. 13a, 14. 13b; Val. Max. 3. 5. 3. 41Pliny’s categories differ from those of modern geologists, who name the stone “calcite alabaster.” Pliny calls it “alabastrites,” and suggests it is a variant of onyx. Plin. HN 36. 60. He also discusses variants of alabaster at HN 37. 73. On Roman uses of the stone, see di Leo 1989a; Gagetti 2006, 64—72. 42The Egyptian import: de Nuccio 2002, 368, no. 68. (It dates to the second century BCE, date of Roman reuse unknown.) Other examples, including those for imperial burials: de Nuccio 2002, 369—370, nos. 69 and 70; cf. Guilliano 1979, nos. 145 and 149. Molly Swetnam-Burland. Egypt in Italy: Visions of Egypt in Roman Imperial Culture. Cambridge, University Press, 2015, pp. 25—27. © 2015. Photo, description (2): M. Swetnam-Burland. Egypt in Italy: Visions of Egypt in Roman Imperial Culture. Cambridge, University Press, 2015, pp. 25—27, figure 1.2 a, b. © 2015. Photo: Musee du Louvre. © 2015. Description (1): K. Jansen-Winkeln. Inschriften der Spätzeit. Teil II: Die 22.-24. Dynastie. Harrassowitz Verlag, 2007. S. 302.